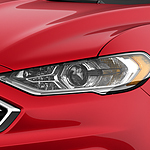 What exterior additions come as an option with the Ford Fusion SE? For any purchaser of a vehicle, knowledge of their options when they are standing beside a vehicle on the lot adds to the attraction. Though the Ford Fusion S is a great vehicle, the Ford Fusion SE is a considerable step up when you consider the options available. When you stand beside a standard Ford Fusion SE, think about what you would be seeing if you added these options. Add on halogen fog lights and automatic high/low beam adjustments to the LED headlights. Consider augmenting your paint job with a ruby-red metallic tinted clearcoat or a burgundy metallic tinted clearcoat. If you prefer you can choose a white-platinum metallic tri-coat for added paint protection. Accent it with a chrome strip on each door handle and a front license bracket. At Candy Ford in Charlotte, we offer these options for every Ford Fusion SE trim model.